Received on time and looked just as nice (or even better) than the preview. Would order again. These labels were put on candy favors.They were exactly as ordered and were receive quickly. I used these labels for containers I bought here as favors for a bridal shower. The problem was that the containers were super small and these labels hung off the edge. The labels are nice, but it would be helpful if the company made it clear the size and how they fit on their products. this product was exactly what I was looking for and very happy with the label for our cookie containers for the wedding reception. Clean anc classic! The labels added the personal touch I wanted. Everyone loved them. The labels were perfect. The color and the size were exactly what we expected. Although a little pricey (including shipping), it was worth it to have these made rather than try to do them ourselves. we brought these to go on the Cupcakes weve order, they are perfect, THANK YOU! Love these little personalized stickers. I attached them with my tea sachets that I've purchased as my favors. They are great! They give that extra touch, if you want the little details in your wedding. Would most likely buy more, since I purchased 60 tea sachet bags and these labels come in 45, 24 and 8 sets! Our party will be in two weeks, and we are delighted with the products we have received. We will not know for certain how they are received by others until after the celebration. I was amazed at how quickly the shipments arrived. I thought I was ordering somewhat late, and I had anticipated having a longer wait!! NOT SO -- the products were delivered as soon as promised, if not earlier. these were very nice to put on little gifts we gave out at our reception. We made the Bride to Be feel special! Personalized Labels are probably the most cost effective product you can buy to make people, parties and events special! I ordered two sets, 2 different designs but both for the same theme, for a bridal shower. Had to order two different sets because with so many options to choose from I couldn't make up my mind! I purchased the small oval labels, which we then placed on the mini vanilla scented heart shaped candles we also purchased. How cute! These will be a part of the guests take home favors that will be at each place setting when they arrive. Personalized labels can be used for so many things - especially like the idea of using them to "cover" price tags on gifts, etc. that you can't seem to remove. You can customize the size, colors, text, AND designs to make your labels (also can use as envelope seals! ); They arrived right as expected, no damages, everything perfect. What an inexpensive way to make someone feel special! The quality is great and not flimsy paper! 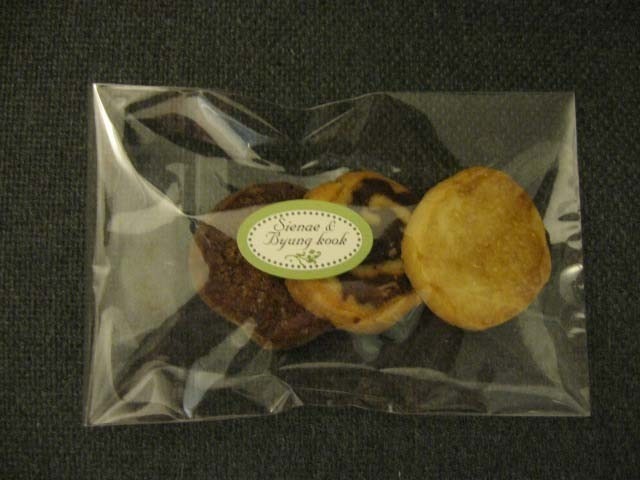 These labels were great to attach on cellophane bags for favors. They also were perfect for small candle favors. I like that there are choices of designs & colors, and that you can fit a good amount of text on them. Just right! This is the 2nd time I've used your website and I cannot say enough about it. It has EXACTLY what I needed both times. I was given very challenging weddings to work on and both times you made my challenge easy and I didn't break a sweat. When they told me what they wanted, I knew just where I needed to go and that you would have the perfect quality product. Took the sweat and tears right out of the equation. Thank you for helping me keep the joy in what I do. The stickers look nice on my wedding favors because its reminds the guest our wedding date. Rich color and excellent quality! I will use the labels on heart shaped tins. I like that they are good size. I got the labels shipped to Canada and I did not like the fact that I was charged for shipping on checkout and then ups charged me another $15 upon delivery. The delivery charges ended up costing as much as the labels making it not worth it for me. I purchased these labels for the shower favors I have planned to give at my daughter's bridal shower. My only complaint is the shipping was more expensive than the labels so what i thought was reasonable turned out to be expensive. I had a shower for my niece the personalize stickers were the talk of the shower! The alignment was perfect on each and every label that I used on our wedding favors. They were just what I needed to personalize the favors. THANKS! The labels make my hand made fundraiser items look professional. I was very pleased with the product I ordered. It was exactly as I wanted it and the way it looked in their sample. I was very very pleased. I personalized these with our initials and design that reflects the theme of our wedding. Nice personal touch on top of heart shaped candle favors. I use these labels on my favors for a bridal shower. they look so cute on the clear boxes with the plantable confetti in them. ordered 40 for rehearsal dinner - heart shaped tins. Ordered stickers with bride and groom names.. filled with dinner mints and placed in organza bags. Perfect. I used the labels for the heart tins filled with mints. Wrapped ribbon around with a thankyou tag & heart charm. Their name label was stuck in the middle on top of the ribbon. It was a thank you at the rehearsal dinner. We ordered these labels for a bridal shower. They look perfect! I am using this on an earring card. The card holds the earrings and has the price but the company name etc.. was on the reverse side of the card. I have put the label at the bottom of the card and this way it shows the company name right on the front. Looks great! Simple fantastic!!!!! Quilt and good. Vera good quality and the delivery was faster then expected. Perfect in every aspect. I am using these to place on cigars that I purchased and they did not come with any label or anything...going with a 50's themed wedding so the damask is perfect. I'm very happy with my product! I used for my friend 40th Surprise Party. It will be cute to have the label to personalize wedding favors and I like the simplicity. Used the labels on cookie bags for the wedding guest gifts. They were beautiful and we are ordering more for the bride to use in sealing her thank-you notes. She loved them so much! We added these labels to the candy-filled glass tubes that we used as our wedding favors! They looked great and allowed us to add that personal touch to go with our theme. love the product! using the labels for a bday party and they came out perfect. the color and price was great. Very good quality for the price. Very pleased, will order again! My wedding colors are ivory, chocolate brown, and sage green. I ordered these stickers to use inside the favor boxes (the embossed, ivory, rectangle boxes). We're putting See's chocolates in the boxes and I have cut strips of parchment paper to fit inside the boxes. The stickers will be used to close the paper around the chocolates, and show when the favor boxes are opened. The sage green color is perfect, and the personalization turned out very nice. I loved these labels. The only thing I would have liked is that there would be more space on the bottom to include the date. Other than that, they are very beautiful. It added a wonderful tough to the wedding favors. These labels really added to our tea party favors. They were made well and looked very expensive when in fact they were not. These labels were perfect with the heart shaped tins. I used these for my wedding favors. The colors and design I picked was exactly as shown. [...] Very happy with this purchase. Definately recommend! Great for any occasion. Great price and value..would certainly order again. they were perfect for my favors to add the finishing touch!! the mini heart tins are going to look great with the personalized labels I ordered. I am going to fill them with red hotts and use them as reception favors. these tins are so cute! We used these labels with the whole leaf tea sachet favors. The print quality was much better than I had expected, and I love how a simple label gave our favor such a finished look. I would definitely recommend using them! I brought the bride and groom favor boxes and personalized them with the mini oval labels. The color scheme was black and white and the labels came in black and white, with a touch of gray as their middle initial, just like the touch of gray on the bride's gown favor box! I was absolutely delighted with your website and will shop here again for all my party needs and tell all my friends as well! I loved these cute labels! The color was exactly as presented and the size fit the purpose perfectly. I used these to place on the heart candles. They will be the perfect favor for a bridal shower. The personalization with these labels will make the candles a perfect accent for the tables at the rehearsal dinner. 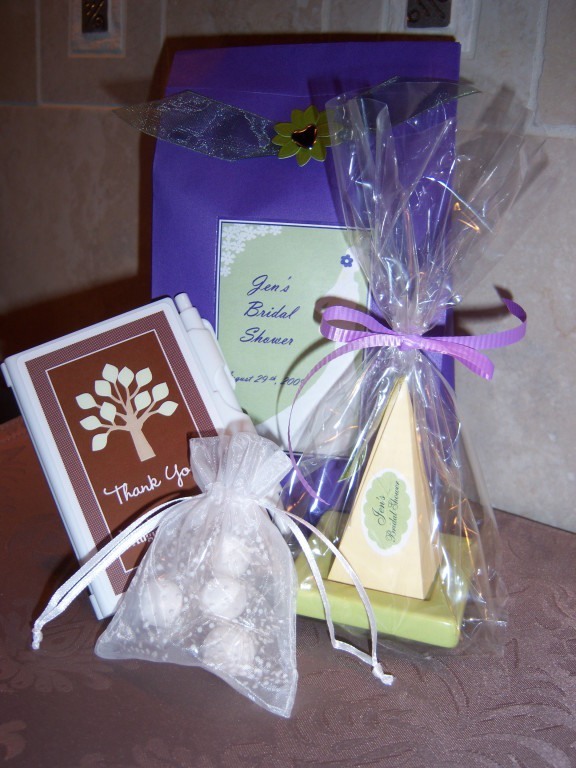 Very cute to personalize shower favors. I gave the remaining to the bride to use for thank you card envelopes. that it can be personalized!! When I received my labels, they were exactly as shown in the example and perfect for my occassion. I was very happy with the product. They fit perfectly on my favors and it is WAY better than printing out that kind of thing yourself. I am not at all one of those "craft" people. I wasn't any good at that kind of thing even as a Girl Scout 25 years ago. The more that I can have professionally done, the better off everyone will be, the better everything will look, and the better quality will be obvious. The last thing I want at my wedding is for anything to look amaturish and so far everything from beaucoup has been top notch! Many designs to choose from. Easy to order. The labels are a great size, I just wish what I put them on was bigger. The color was exactly what I was looking for. We used these to adorn wedding favors but if you need labels for anything- highly recommended. They are just the right size, cute, and great quality. Great personal touch for the mini tins! I got the mini heart shaped tins at Michael's, along with the dove candies, and these stickers were a perfect match to go on the see-through top of the tin. 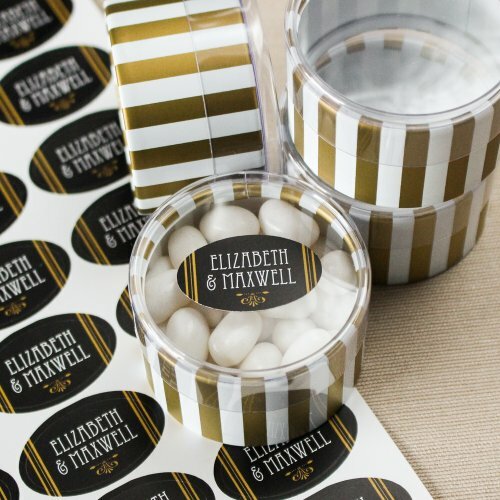 So many stickers to choose from, we found the perfect one for our wedding favors tins. These labels turned out great. We ordered the red heart labels with our names and will be using them on silver heart candy holders. They will make great keepsakes for our guests at the wedding. We will place the personalized labels on our wedding favors. I loved the various styles and colors available. With so many choices, these labels have hundreds of uses. I used mine as personalized seals on my wedding invitations. They looked fantasic! I bought bubbles for my daughters wedding and these labels made a personal touch. Great product. We used these on the mini tins. We used these on the side of the mini tins, for that added extra touch. perfect to personalize my favors. Love the style and it fits the theme of my wedding! The product was just as expected. Used it for the label on some chocolate pillow cake boxes. It was the perfect size. I purchased these monogrammed stickers to place on the tea sachets I purchased as wedding favors. The stickers are fantastic - I love that they display my fiance's and my first initials with our "new" last initial as a background image and the colors matched perfectly with the tea sachets we purchased, as well as the wedding colors! I would definitely recommend these to anyone. The Product is nice to place on a wedding favor but the sizing is a little tricky to what it looks like on line. Also the color is a little off to what you see on line. I was not able to use it for my initial project because it turned out to be too small and off the color, but I used it for something else. The glue in the stickers is good, and the printing was consistently good for all lables . I loved seeing these stickers on the candy holders. They were a cute party favor, but special beacuse it had the names of our guest of honor printed on for a great memory! [...] They are a little pricey for what they are - printed stickers. But otherwise, they work well and are good for personalizing otherwise normal stuff - candles, bags, etc. My bestie and her husband had a very low-key ceremony at the courthouse in NYC. My fiancee and I threw the both of them a surprise backyard BBQ the next day to celebrate them and their nuptials. We called it a Wedding Toast and the theme was Champagne and Wine influenced (i.e. 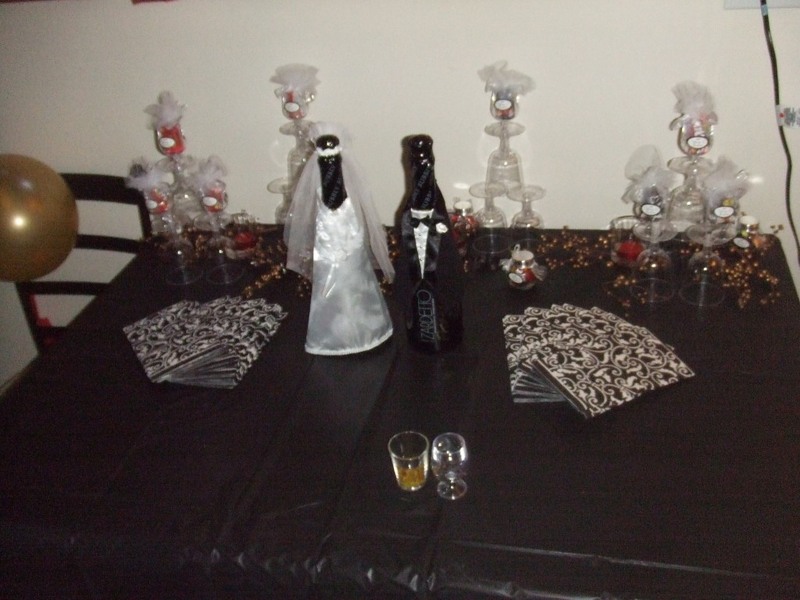 champagne bottles & wine flute balloons, miniature wine glass favors in organza that doubled as shot glasses once opened, etc.) We used the little labels on the miniatures and everyone just adored the creative, personal--and practical--nature of of the favors. The labels weren't completely necessary, but they added that 'little something extra' that took the favors and our sentiment to the next level. They add a sweet--and inexpensive --little flare to any favor or event. Really cute with lots of uses! Used these on the back flaps of our wedding CD favor envelopes; they worked perfectly for that and also on other envelopes. They matched the design of our CD labels, and everyone thought they were really cute. Lots of labels for a decent price, with multi-uses! Too small for what I thought, of course they are minis!! Even if they didn't worked for what I thought I been using them for the thank you cards and notes. Great shape, great color, great quality! Used it on heart-shaped votive tins from this site, they looked great and added nice detail. yeah, the pictures when you go to order are TINY but i guess they are life-size... it was hard to tell exactly what you were getting. but they arrived and they were perfect. you could probably do them yourself but you have to weigh the cost of buying them against the hassle. I used these personalized labels on the packaging of the tea sachets / dripping trays favors I gave to my guests at the bridal shower I hosted. The color matched the favors perfectly! These were perfectly functional little labels. Easy to use, ink in the right place. I have no complaints. Buying a product without seeing it first is always a little scary. I was very pleased with the labels I ordered [...] I will not hesitate to order again and will definitely recommend this company to others. My husband and I used these to personalize our wedding favors. There were enough options available that we could create exactly what we wanted! Would definitely recommend. These are great for labeling the clear plastic cover of the heart shaped travel candles as well as using to close the gift bags. I bought the tea sachets for my daughter's bridal shower and these fit perfectly. i used these great labels as the wedding favor "tags" and also on my thank you cards! loved these! These were really neat. We got them to go with the candle heart tins (which were awesome) for our wedding favors. The only thing we realized after we got them was that there's no space for the date. So in retrospect, we would've gotten something that could hold our names and the wedding date, but other than that, they were really nice. Used for favors @ wedding. I should have ordered bit more bigger label to fit on the pkg better, but bride was very satisfied w/it. If label has little bit of gloss on it, it'd be adding little more final touch. I USED THIS PRODUCT FOR OUR WEDDING FAVORS!!! These just added a little more personal touch to our shower! They are worth the cost! I used these personalized stickers for the wedding favor tins, and they worked great! However, the price was a little steep. But they are of great quality, so I guess the addage, "you get what you pay for" applies here. The labels look great on the teabags I purchased. They added that little extra touch of personalization and sophistication that really made my favors pop. I was very pleased to see the labels arrive and have no errors in printing. I have gotten printing back and it looks like it was run through a low grade printer and is all streaky. Not These! The colors were solid and rich in the background and on the lettering. The color choices are great and the font choices make the labels exactly what I was looking for. I have no issues with this product. I would have liked if you could zoom in on the samples on the website. However, the actual product turned out to be great. Bought these to go with the tea sachet favors - they look really classy! These stickers are adorable!! I'm using them on little tin cans that I'm filling with chocolates and they work perfectly. Very good price for the value and quality of the item. Labels were used on the tea for the Bridal Shower and everybody that commented thought that it was very tasteful and an elegant touch. So cute, just what I wanted. They are so cute! They match my event perfectly, I was so happy to find them. It's unlikely I'll have another ocassion to use them but if I do, I'll definitely order them agian. The vanilla scented candles that I used for our shower was a big hit and very original, I wanted to choose something that was unique but people could use. I used these on the favor gift boxes and they look fabulous. Used these on the tea sachets, but I imagine you can use them to personalize other items. I used the personalized mini-labels to put on birthday favors for my mom's 85th birthday party. The labels were attractive and also very sturdy so that none of them tore as they were placed on the favors. They also adhered well so that they stayed in place. My mom loved the personalized touch. I used these to label the heart favor tins as bridal shower favors. The ovals are the perfect size for the tins. They have a nice selection of colors and fonts to fit your theme. My only complaint is that the rush service is pricey. Great and very easy way to personalize the tea sachets for favors. I used these stickers on the top of favor boxes to hold ribbon in place and display our names on the favors. I loved them. They were just the right colors and added a perfect touch. I used these labels for the favors at the bridal shower. I ordered these stickers with "Thank You" text printed on them. I plan to put them on the lid of my favor tins, that I will put at each place setting at my rehearsal dinner. Looks great! My husband and I renewed our vows and we wanted to give small favors and the labels were a great addition to our take home favors. Thank you so much for my order of the Mini Labels. I have been very "iffy" on ordering products online for my wedding, especially personalized ones, but these labels were exactly what I wanted! Beautiful and simple! The colors matched our theme perfectly (spring, yellow) and I am so excited to use them on our favour packages. Thank you so much. You have made a major impact by doing something so small for our big day! I have sent your website to all my friends getting married and hopefully they will be using you as well. Thank you again! The stickers are cute, but they are limited in characters. Customer services is amazing. They called and helped figure out a way to fit the message on the sticker. They don't stick very well though. I bought them with the white sake cups and created my favors like the picture, but the stickers would pop up on the sides. The stickers are really cute though. Probably would work better on something not curved. We filled the hearts with personalized m&m candies. They were just the right size & looked adorable with your stickers! Great product. Fits hearts perfect. Your guest will like the additional touch. These labels are a beautiful addition to any bridal related favor. Perfect for personalizing your special event. They were just what I needed to personalize my wedding favors. My husband and I had jars of jam as favors. The labels fit perfectly and were affordable too. We used this product for our annual holiday luncheon on the tea pyramids and they worked out great! Used with the tin wedding favor and it was perfect. I use the labels for tin mints. They were a little smaller than I wanted but they were still cute. The price was what sold me. I do recommend this product. I would definitely recommend the personalized stickers. The font style and size were perfect and they added a very nice touch to the tea sachets. The only con was that some of the stickers lifted off the sides of the sachets. A very minor issue but, something to note. Not only did I use these on the individual tea sachets that went into gift bags, but I had enough left over to include on the photo cds I sent out with all of our thank you cards, as well as in making a wedding scrapbook! These were lovely! Wasnt sure how I was going to use these stickers, but they were personalised and came in handy. I ended up sticking them on the take home cake favours we had made at the local bakery. It made them lovely souveneirs of the event. The sachets were wonderful, but the stickers did not stick completely! Uses product on daughters wedding cookie bags! Perfect in everyway,size, color ,design. These [...] were easy to use. They fit and stuck where they were supposed to, and stayed there. We had many compliments with the labels that we attached to the heart tins. Very simple but great. I USED THE MINI PERSONALIZED LABELS ON THE HEART CLEAR TINS THAT I ALSO PURCHASED FOR MY DAUGHTER'S SWEET SIXTEEN CANDY FAVORS. Perfect touch to our favors! these oval personalized labels were the perfect added touch for my sister's surprise bridal shower. I placed them on the Tea Forte's that we handed out as favors. All were impressed at the elegant detail these added to the event. thanks for providing them. I'd give a 5 for great if the price was a bit less expensive otherwise they were easy to use and just wonderful! I used the labels on the Whole Leaf Sachet Tea Favors and they were cute, easy to use, and the perfect size. The color complemented the Tea Favor packaging. I loved them. Beautiful & affordable...adds a lovely touch! 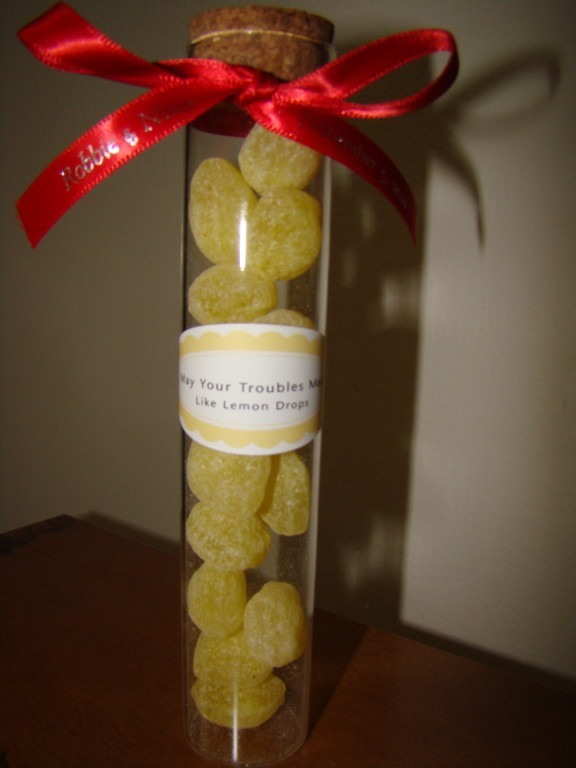 Size 1.25" x 0.75"2.25"W x 1"
Turn any wedding favors into custom creations simply by adding personalized oval labels. Add them to everything from boxes and tins to invites and save-the-date cards. Choose from dozens of elegant wedding designs and a wide array of stylish colors. Add your custom text such as the couple's names, wedding date or a special message. Labels are removable waterproof vinyl for easy application.